Linear dimensions annotate linear distances or lengths and can be oriented either horizontally, vertically or aligned parallel to an existing entity or to the selected origin points. Starting from a linear dimension, you can add a baseline dimension or a continued dimension. A baseline dimension inserts an additional dimension from a common first extension line origin of a previous linear dimension. A continued dimension continues a linear dimension from the second extension line of a previous linear dimension. Click the Linear tool button ( ) on the Dimensions toolbar. Choose Linear in the Dimensions menu. Type dimlinear in the command bar, then press Enter. Press Enter, then select the line or linear segment of a polyline you want to dimension. Specify the origin of the first extension line, then specify the origin of the second extension line. The dimension line displays dynamically. Move the cross hairs vertically to create a horizontal dimension, or horizontally to create a vertical dimension. 3. Position the dimension line. Click the Aligned tool button ( ) on the Dimensions toolbar. Choose Aligned in the Dimensions menu. Type dimaligned in the command bar, then press Enter. 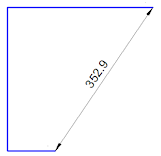 Click a point to position the dimension line. Press 0 (zero) to place the dimension line at the dimension points, thus omitting the extension lines. Click the Rotated tool button ( ) on the Dimensions toolbar. Choose Rotated in the Dimensions menu. Type the rotation angle in the command bar, then press Enter. Enter the rotation angle by specifying two points. 4. Position the dimension line. You can place the dimension line either at the specified rotation angle or perpendicular to this direction. Click the Baseline tool button ( ) on the Dimensions toolbar. Choose Baseline in the Dimensions menu. Type dimbaseline in the command bar, then press Enter. A baseline dimension displays dynamically starting from the most recently added linear or angular dimension (if any). 2. (option) Press enter, then select the starting dimension (see note below). 3. Specify the origin of the next extension line. Press the Esc key to stop creating baseline dimensions. When selecting the starting dimension make sure to click the first extension line or the first half of the dimension line in order to use the first origin point of the starting dimension as the origin point for the baseline dimension. If you select an angular dimension, stacked angular dimensions are created. The distance between the stacked dimension lines is controlled by the Dim baseline spacing setting in the dimension style. Click the Continue tool button ( ) on the Dimensions toolbar. Choose Continue in the Dimensions menu. Type dimcontinue in the command bar, then press Enter. A continued dimension displays dynamically starting from the most recently added linear or angular dimension (if any). Press the Esc key to stop creating continued dimensions. When selecting the starting dimension make sure to click the second extension line or the second half of the dimension line in order to use the second origin point of the starting dimension as the origin point for the continued dimension. Otherwise the new dimension line will partly overlap the starting dimension. If you select an angular dimension, continued angular dimensions are created. Click the Arc tool button ( ) on the Dimensions toolbar. Choose Arc in the Dimensions menu. Type dimarc in the command bar, then press Enter. 2. Select the arc or polyline arc segment. The arc length dimension displays dynamically.